Sandy clearings, shores, and plains; borders of forests and fields and in open (rarely swampy) forests, usually with aspen, white birch, and/or jack pine. A small tree especially characteristic of recently burned or cleared areas; frequently clonal from root suckering. The seeds are very long-lived in the soil, germinating after fire or other disturbance. Attractive and conspicuous in bloom late in the spring, especially along highways in the northern part of the state a few years after construction or remodeling of roadsides. The umbel of a few small bright red fruits is absolutely distinctive in midsummer. 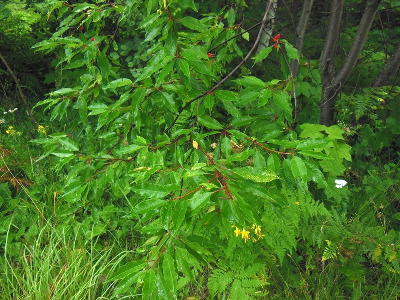 The bark is reddish, a helpful character for quick distinction from other species that may be superficially similar, such as P. mahaleb (contrasted in the key) and P. americana (with calyx lobes pubescent within, slightly larger petals, and no gland-tips on the leaf teeth). MICHIGAN FLORA ONLINE. A. A. Reznicek, E. G. Voss, & B. S. Walters. February 2011. University of Michigan. Web. 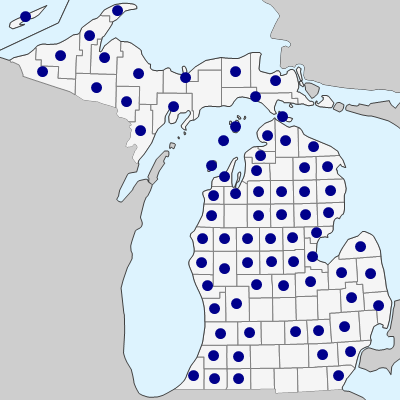 April 21, 2019. https://michiganflora.net/species.aspx?id=2524.